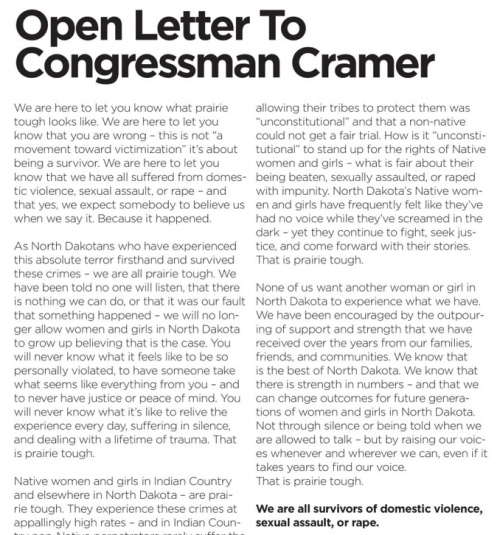 BISMARCK– Senator Heidi Heitkamp’s open letter advertisement featuring survivors of sexual abuse to Congressman Kevin Cramer was well intended, but not well managed, she said. 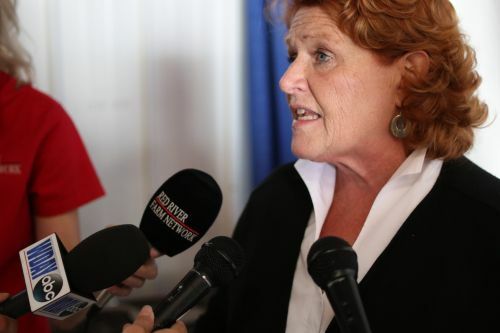 Heitkamp, known as the most endangered Democrat in the nation, is in the final weeks of a heated race against Cramer for her Senate seat. She knows forgiveness might not come easily, but is taking responsibility for her office’s lack of due diligence. A total 127 women’s names or initials were featured in the advertisement. A large majority of the women had given permission, but some claim that they either did not authorize the use of their names or are not victims of sexual assault. A campaign staffer has been fired because of the incident, Julia Krieger, communications director for Heidi Heikamp for North Dakota, said. Krieger could not say how many women are claiming their names were used without permission. Some of the women named in the letter took to Facebook to share their resentment about being named saying they were “disgusted” and “furious” to see their names in the advertisement. One woman claiming the outing goes against Marcy’s Law is looking into hiring an attorney.